4 days before the school holidays ended I went for an audition to star in the 2013 Sydney Royal Easter Show Commercial. I was selected and that meant I had to miss the first day of school. Before filming, I read the whole script and instructions. Even though there were no speaking parts, there were cartoons called storyboards, that explained how the scenes were going to happen. This is the first time I had seen cartoons describing the scenes and I really liked it. 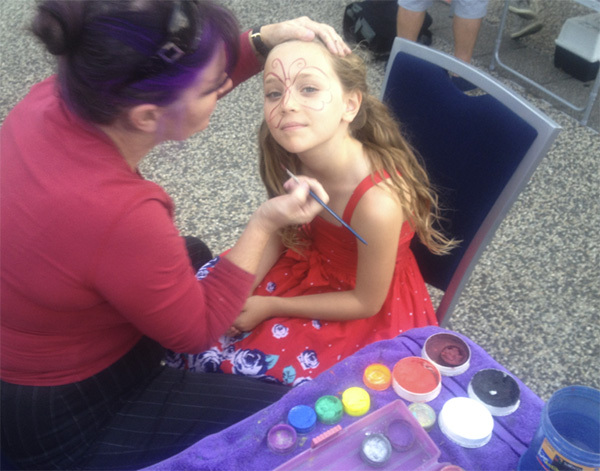 I was cast as a little girl in a family visiting the Easter Show. It was really fun working with the animals and I liked the way the scenes were organised by the director, Adrian Brown. Here it explains what I have to do in the zoo scene. Panel 2: I started by pulling my “brother’s” hand into the farming area. Then I patted the sheep. Panel 6: In this last scene we got some cool glasses and got funky! It is interesting to me how they explained all this in pictures. This was the last scene. The face painter arrived at 8pm to paint the kid’s faces. I liked that a lot. The 1st panel was the one that took the longest to shoot. The 2nd and 3rd panels are only different camera angles of the 1st panel. Although all 4 of these panels were shot, the last panel didn’t make it into the commercial. That 4th one was done in front of a green screen and I guess the director liked the real crowd instead. Most of my class at school told me that they saw me on TV in the ad! So many people were involved in making this commercial. I was surprised it was only 30 seconds long. I didn’t get home until 11pm that night, but I still was not tired. Thank you to everyone.